Bone china is a lovely material for dinnerware. Light yet robust, the superior quality is self-evident. The simplicity of this collection is given a lift with minor ridge detail. Designed by award-winning ceramics designer Simon Stevens, this collection has that special touch that makes it indulgent and luxurious. 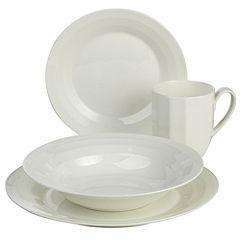 This set comprises four each of the following: dinner plates, side plates, soup plates and mugs.